Providing lighting in an Islamic religious building is considered to be an act rewarded by God, and before the introduction of electricity donors paid for large numbers of lamps. 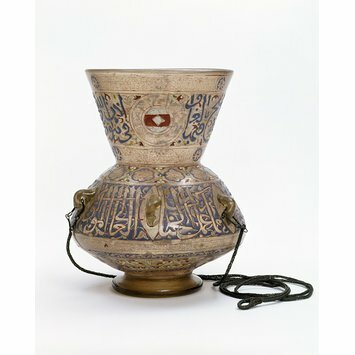 In the 14th century, when Egypt and Syria were ruled by the Mamluk sultans, the glassmakers of the region produced large and magnificent lamps with enamelled and gilded decoration, often including bold inscriptions in Arabic. In this example the text in blue in the upper band comes from the Qur’an, while the text in white below names the donor. He was Aqbugha, a high official at the court of the Mamluk sultan al-Malik al-Nasir Muhammad during his long third reign (1310–1340). The decoration of the lamp also includes two rows of three large roundels. At the centre is a white diamond shape on a red ground. This device was the badge of office of the master of the sultan’s wardrobe, the first post that Aqbugha held at court. Later Aqbugha became supervisor of construction work for the sultan and the quotation from the Qur’an on the lamp refers to the construction of mosques: ‘[Shining out] in houses of worship. God has ordained that they be raised high and that His name be remembered in them, with men in them celebrating His glory morning [and evening].’ Equally appropriately, this text is from the surah called Light (24, verse 36). In the 1330s Aqbugha commissioned an important religious building in his own name. This is the Aqbughawiyyah, one of the madrasahs, or colleges, attached to the famous Al-Azhar Mosque in Cairo. The lamp was probably made for this building. Lamp made for a madrasah founded by the Mamluk official Aqbugha, Egypt or Syria, about 1340.
shining out in houses of worship. God has ordained that they be raised high and that His name be remembered in them celebrating His glory morning [and evening]. Part of what was made for his exalted excellency, our lord, the great amir, ..., Sayf al-Din Aqbugha 'Abd al-Wahid, [officer] of al-Malik al-Nasir. 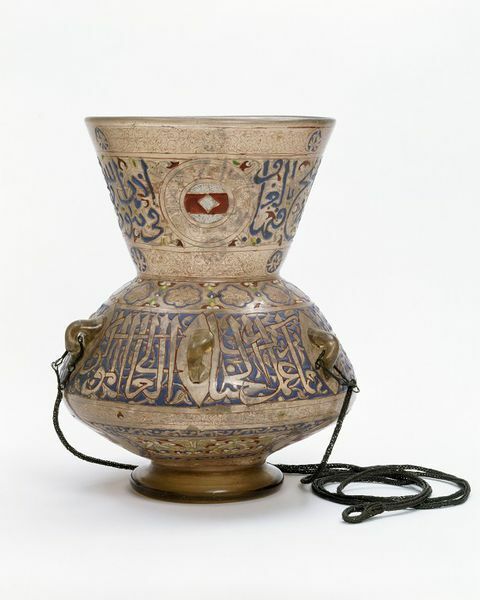 Sayf al-Din Aqbugha, who is named in the inscription on the lamp, was promoted to the rank of ustadar in 1331, and he was disgraced and imprisoned in 1342. He built an important madrasa at the Mosque of al-Azhar in Cairo (the Madrasa al-Aqbughawiyya) which is dated 1340, and this lamp was probably suspended from the ceiling in that building. Purchased in Paris as part of "Dr Meymar's Collection", a group of historic objects sent to France by the Egyptian government, for display at the international exhibition of 1867. In 1869, following discussions at a parliamentary Select Committee in London, the South Kensington Museum (today the V&A) was authorised to buy this collection, with a British government grant. "Dr Meymar" was Husayn Fahmi (c.1827-1891), also called Husayn Pasha al-Mi`mar or al-Mi`mari (transliterated as "Meymar", meaning architect), a senior official in the Egyptian administration. He was (in 1864) the chief architect of the Majlis al-Tanzim wa'l-Urnatu, a committee in charge of public works in Cairo, and later (1882-5) a member of the Comite de conservation des monuments de l'Art arabe, which oversaw Cairo's historic heritage. Throughout his career, he was responsible for salvage and removal of historic architectural fittings, and for the construction of modern monuments and streets in the Egyptian capital. Lamm, Carl Johan. Mittelalterliche Gläser und Steinschnittarbeiten aus dem Nahen Osten. Berlin, 1930. Page 440, no. 47. Watson, O. "Glass from the Islamic World," Glass (ed. R. Liefkes), London, 1997, p. 35. Lane-Poole, S. The Art of the Saracens in Egypt, London, 1886, pp. 215-16 and fig. 93. L.A. Mayer, Saracenic Heraldry. A Survey, Oxford, 1933, pp.67-8. The lamp was made for one of the madrasahs, or colleges, attached to the famous al-Azhar mosque in Cairo. The madrasah was founded in 1339-40 by Aqbugha, who is named in the inscription. He began his career at court as keeper of the sultan's wardrobe. The white diamond representing a napkin is the badge of this post.